If you're looking for a quality mid-range EDC very little comes close to the outstanding Griptilian. The Benchmade Griptilian is without a doubt one of the best folding knives we’ve ever used. It’s an extremely versatile knife that has quickly become one of our favorites. With the large or small variants you have the choice of something small enough to carry around on a daily basis or big enough to be useful in heavy duty situations. With all those blade and color variations there is certainly something to please everyone in terms of customization. The premium stainless steel blade is of the same quality we’ve come to expect from Benchmade’s knives. Even on the larger model, at 3.45 inches, the drop-point blade is a perfect length for an enormous number of everyday tasks but still small enough to carry. The blade is sharpened on both sides and crazy sharp right out of the box. It has proven itself to stay sharp for several months of moderate use and what’s more Benchmade offers their usual lifetime sharpening service for this knife too. The 154CM blade rates a 58-61HRC on the hardness scale so it should definitely hold an edge over time. The handle consists of glass-reinforced polymer grips (something you don’t see too often called “Noryl GTX”) with a tightly textured surface. The grips fit well in the hand and can be held hard and steady with comfort. Folded, the knife is thin enough to fit easily inside or clipped onto your pocket. The handle is held together by stainless steel liners, so it seems like the whole thing will stay together well after long use. On the version we reviewed, the grips are black, but again there are a number of other colors available. The real treat with this knife is the AXIS locking mechanism and the ambidextrous thumb-studs. While I’m not left-handed the lefties out there finally have a quality knife here that they can use easily. 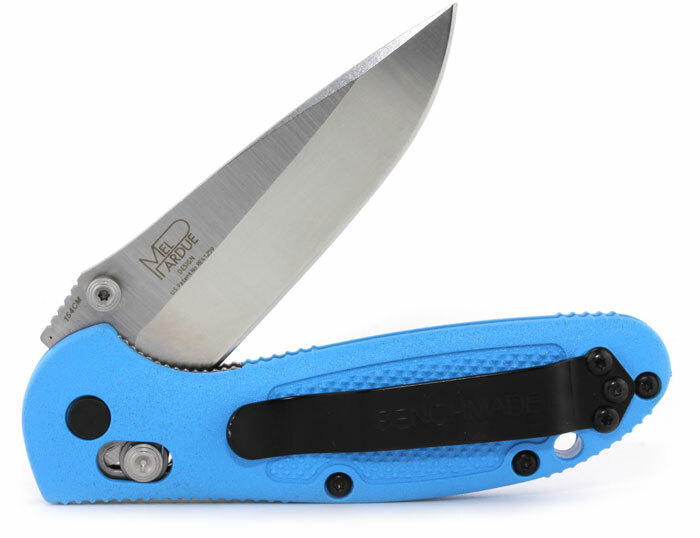 I usually pull the knife open with the studs, but it has a fantastic hinge action that flips open with an easy flick of the wrist when the lock is pulled back. Either way, the Griptilian has always opened smoothly and easily in our experience. The lock and hinge as a whole have a solid build, and the knife is always snugly held in place when closed and locked. The mechanism makes a reassuring, solid-sounding click when opened though this may not be to everyone’s taste, especially hunters in the field. The pocket clip is also well-built and can be mounted on either side of the knife (another big help for lefties). The handle has a lanyard hole at the back for those who like to carry their knives that way. 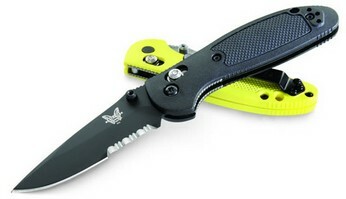 A separate sheath isn’t included, but Benchmade offers a number of these to fit this model. In the box you’ll find instructions on cleaning and when to lubricate the knife. Benchmade makes it clear that you ought to sharpen the blade frequently enough so that it never gets dull. 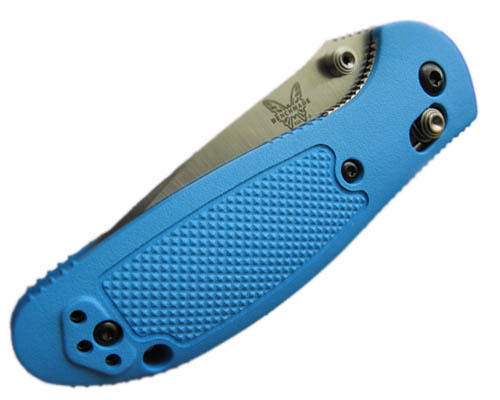 Benchmade classifies the Griptilian as one of its “Blue Class” products, which is a mark of excellent quality. So far, we have to agree. At just under $100 a pop, the Griptilian is not the cheapest knife out there, but in our opinion the quality of the blade and the mechanism make this a bargain for a folding knife in this class. It is strong, sharp, well-built and even good for lefties. If you don’t like the steel-on-black look, other colors and configurations are available. Overall, it’s a top-notch knife from a reliable manufacturer. The Good: Super smooth blade action. Solid lock-up. Nice grippy textured handle. Near perfect ergonomics. The Bad: Handle material may feel too plastic-like to some. Somewhat loud locking click. Bottom Line: Quite simply one of the best all-round EDC knives you can buy. Get one.